Lone Star Carpet Care is celebrating its 21st year of professional carpet cleaning by offering carpet cleaning specials to both new and current clients. According to the Carpet and Rug Institute, homeowners should vacuum their carpets at least once a week with a high quality vacuum cleaner. The Institute also recommends that homeowners hire a carpet cleaning professional to deep clean their carpets at a minimum every 12 to 18 months to remove embedded dirt and grime. Lone Star Carpet Care is offering new and current clients carpet cleaning discounts to professionally clean their carpets. 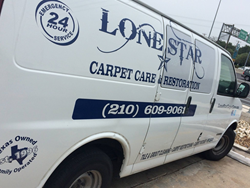 Lone Star Carpet Care offers exceptional carpet cleaning for both homes and businesses. They offer steam cleaning using truck-mounted carpet cleaning machines that use the hot water extraction method to ensure your carpets are deep cleaned. Home and business owners can find the carpet cleaning deals at http://www.lonestarcarpetcare.com. Lone Star Carpet Care guarantees their work and their customers leave raving reviews of their work. They are a family owned and locally operated carpet cleaning company that would like the opportunity to serve you and earn your business. Home and business owners want to know their carpets are cleaned correctly and Lone Star Carpet Care’s professional carpet cleaning is guaranteed. For our clients who have served in the military, Lone Star Carpet Care offers military discounts as well.